We are filming more and more dance shows now and we are loving each and every one. Dance Show Filming is meaning we get to travel the UK seeing amazing talent on stage and producing a product that people will watch over and over again. 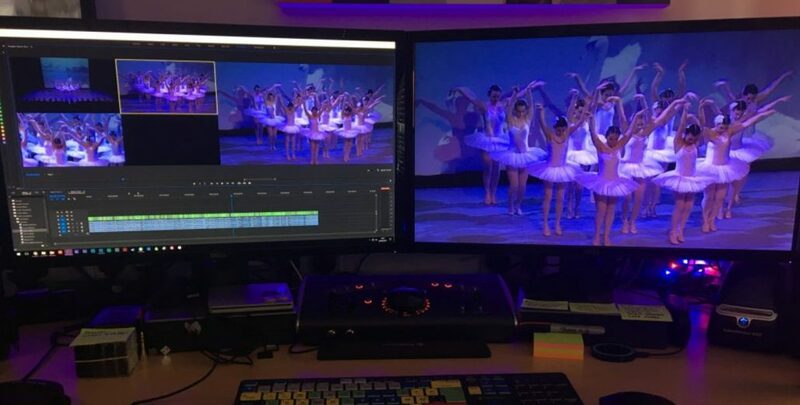 Dance Show Filming is something we are investing in constantly, from the cameras we use, the setup within theaters, to the editing suite we have built to create the finished products we do. Another big thing is we feel we now have a great understanding of choreography and how source dance schools want their routines shown. We are the first to admit we can’t dance, but we know when a routine needs a wide shot to show the formation, or a reaction or head turn needs a close up to make an exciting edit. That’s something that is learnt from hours of editing dance shows. We understand when something maybe didn’t go right on stage, so we will do our best to edit around that to make your finished DVD click as perfect as it can be. Our background in theatres also mean we can work well with the venues to get the best from lighting and sound, working with any visual effects you may be using so we can capture it all on camera in the best way. You may want to read our post on how important lighting is in your shows here – this is something we are always willing to work with you on if you need advice. So rest assured when you book PER Productions for your Dance Show Filming, your getting a company that cares and understands your shows. We look forward to working with you very soon! You can find more info here on our Dance Show Page – examples are there to watch, and pricing is available. A Feature Film in 9 Days The big Feature Film edit!